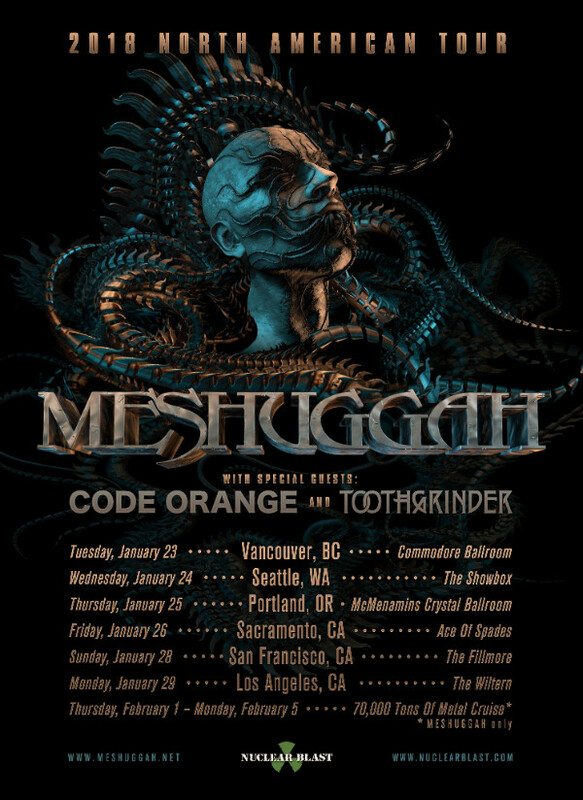 Swedish extreme tech-metal pioneers MESHUGGAH have announced their 2018 North American tourwith special guests CODE ORANGE and TOOTHGRINDER. The tour will kick off at the Commodore Ballroom in Vancouver, BC on January 23rd and make stops in Seattle, Portland, and San Francisco before concluding at The Wiltern in Los Angeles on January 29th! Following the 6 show trek,MESHUGGAH will perform at the 70,000 Tons Of Metal Cruise. MESHUGGAH is touring in support of their highly acclaimed eighth studio album, The Violent Sleep of Reason which secured the band their first GRAMMY nomination for “Best Metal Performance.” The album also debuted at #17 on the U.S. Billboard Top 200 chart as well as landed at #9 on theCanadian Top Current Albums chart.